2 Have you ever splashed around in shiny galoshes during a storm? Rain makes a great backdrop for playing games. The air smells fresh, and puddles are fun. But one kind of rain is not refreshing. 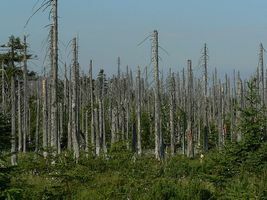 Acid rain harms people, animals, and plants. Acid rain should go away! 3 People are hurt by acid rain. A young boy named Marco lived in New Jersey. The northeastern part of the United States has many smoggy factories and smoke-spewing power plants. Marco loved to look up into the sky as it rained. He liked to open his mouth to catch the fresh-tasting water. However, this rain was not clean. It was acid rain. It came from pollutants created by the factories close to Marco's home. Marco didn't know that this kind of rain would make him sick. 1. Look around your city or town. Make a list of factories or power plants that emit lots of smoke. Then, write a formal letter to two of these places and ask them if they are doing anything to make sure the smoke from their factories is as clean as possible. Tell them a little bit about acid rain. Then, send your letters and watch your mailbox for an answer. 2. Pretend that you are organizing a fundraiser to help people harmed by acid rain. Design a poster for your fundraiser. What activities would you have, and what would your charge for the activities? How much money would you like to raise with your event? Try to include this information in your colorful, brilliant poster. Feedback on Acid Rain, Go Away!